A birthday calendar is a great way to remember and display the birthdays for a school class, your friends, relatives, organization or group. We've created a few templates and printable birthday calendars for you to choose from. The birthday calendars for Excel are perpetual, meaning that you simply list the birthdays and then you can create a yearly birthday calendar every year by changing the year. This template is based on our other school calendar and yearly calendar templates. It lets you list the birthdays for each of your students in your class, and it highlights those dates in the yearly calendar. Simply enter the month, day, and name for each birthday. 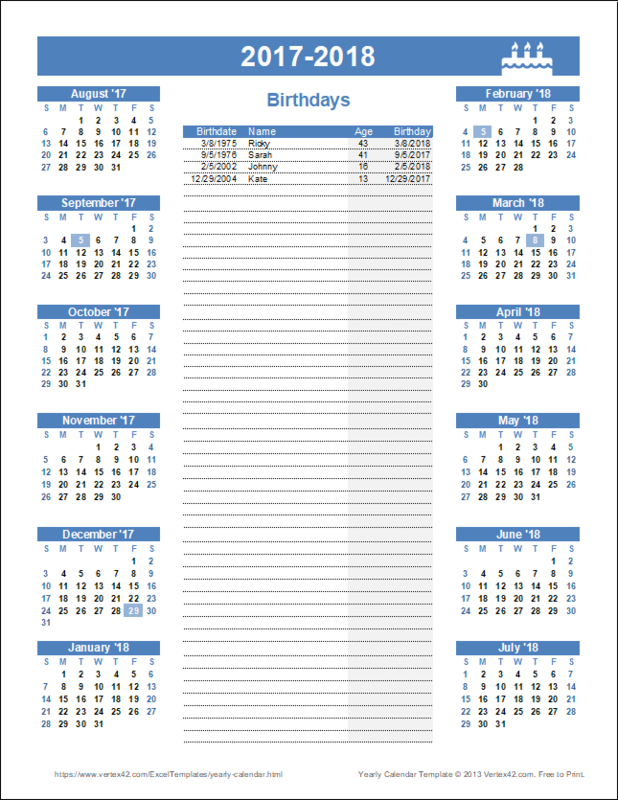 This template can be used as a perpetual birthday calendar. 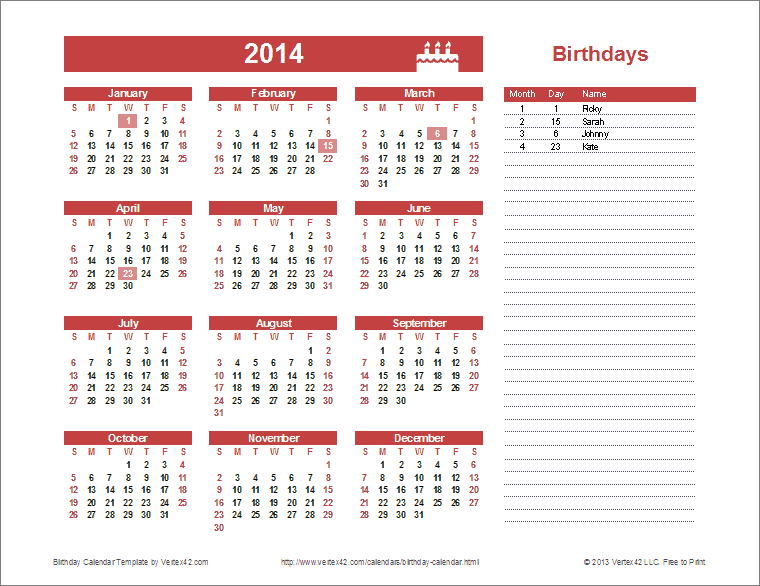 You can print a new calendar each year without having to enter all the birthdays again. Simply change the year and start month to create and print a new calendar. The spreadsheet includes 3 worksheets. Two of the worksheets are shown in the screenshots above. The third is basically the same, except that it includes two columns of birthdays, allowing you to show up to 100 birthdays on one page. 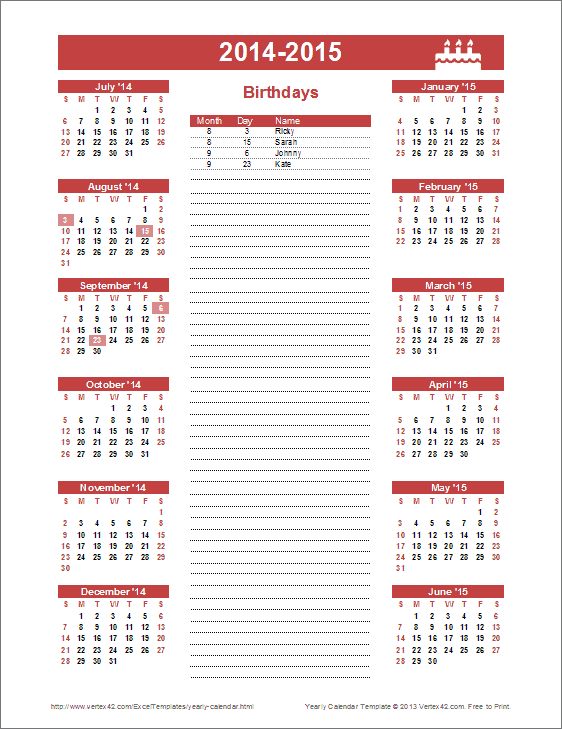 This version of the birthday calendar is the same as the one above except that you enter birthdates and the spreadsheet calculates and shows the person's age on their birthday. IMPORTANT: Birthdates and ages are sensitive personal information, so this spreadsheet should only be used for your own personal use and NOT shared with anyone else. This template uses the DATEDIF function to calculate ages. See my article "Use DATEDIF to Calculate Age in Excel" for an in-depth explanation of formulas for calculating age. These templates are theme-enabled, meaning that you can change the color scheme by going to Page Layout > Colors, if you are using Excel 2007 or later. Some other versions of Excel, or other spreadsheet software may not have this feature. But, these calendars are not very complicated, so you can change the formatting of the spreadsheet without too much hassle if you want to get really fancy with some color. Please remember that birthdays are the type of information that people generally like to keep private. So, do not share any birthday information. Be careful to make sure that if you are sharing a birthday calendar, that you do not make that information available to the public.